Maria Lexa has extensive experience as a master teacher in theatre, both in the USA and Europe. Her workshops focus on training the total actor and developing each person's unique creativity. Individual expression is emphasized, and at the same time, the group process is also a high priority. The workshops explore physical expression, voice, energy work, character study, humor, individual and collective improvisation, composition, performing with masks and puppets, and creating original texts. Workshops are available for professionals, amateurs, or youth, and the teaching is adjusted to the experience level of group. Sun & Moon Ensemble participated in a collaboration with the San Francisco schools through an exciting guest artist arrangement with San Francisco School of the Arts (SOTA). In the spring of 2006, Maria Lexa taught an intensive workshop in giant puppet-making with a group of theatre tech and design students at SOTA. 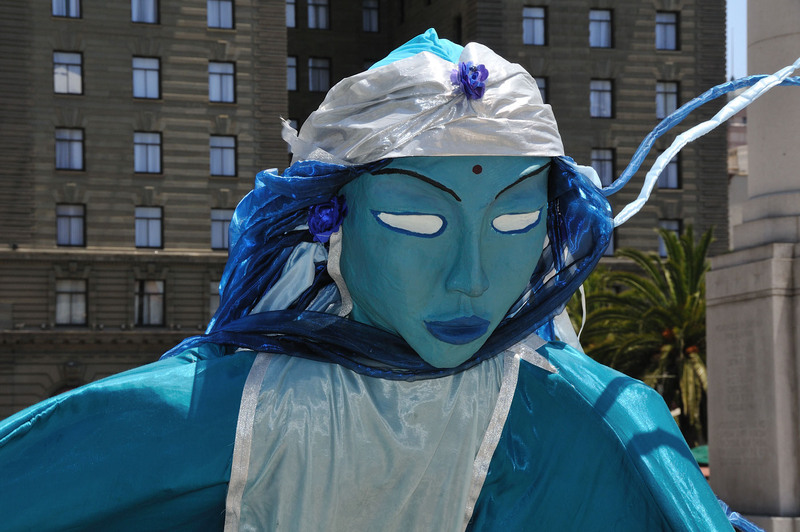 The result was two stunning 10 ft. high puppets representing the sea god and sea goddess. As their artistic contribution to SOTA’s graduation ceremony in June, the students performed in the puppets, and led the entire procession of graduates into the auditorium. The puppets made a great impression on everyone present, and Sun & Moon Ensemble welcomes such teaching projects with other schools and educational institutions. We begin with the performer's own instrument - the body and voice. We will work with concrete techniques as well as exercises that release the imagination. We will work individually and collectively with physical expression, visual expression, composition, improvisation and self-choreography. Through the body's own intelligence and expressivity, we enter into drama, poetry, and humor. Character study is central to the actor's work. It integrates all the elements-body, voice, text, rhythm, and visual poetry, and forms them into a coherent unity. Character work is the art of re-creating a complete personality with its complexity and contradictions, and this expands the performer's personal creativity. Mask theatre is deeply rooted in physical theatre and it is a precision art. Masks create magic in physical theatre and those who pursue their study of this will learn to lift the magic to an even higher level. 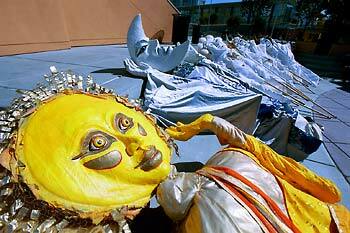 There is even the opportunity to perform inside a 3-meter tall moving puppet. Comedy can be mimic, verbal, naturalistic, grotesque, or clownesque. It has its own ground rules and principles, which can be studied, trained, and, above all, enjoyed. Comedy is a recurring theme, which runs throughout the workshop. The workshop is open to beginners as well as those with theatre experience. For our mask and character improvisations, participants are encouraged to bring clothing, textiles, scarves, hats, coats - anything that can be used to create costumes. Small music instruments and percussion are also welcome. Training for the total actor begins with the performer's instrument: one’s own body and voice. The body is trained not just for its own sake, but to express the spirit, emotions, and imagination of the individual. Much of the training focuses on physical and vocal mastery and precision. At the same time, the actor learns to free the imagination and find the organic flow of body and soul together in the creative process. All this is accomplished in an intensive dialogue between the master teacher or director with the actors. 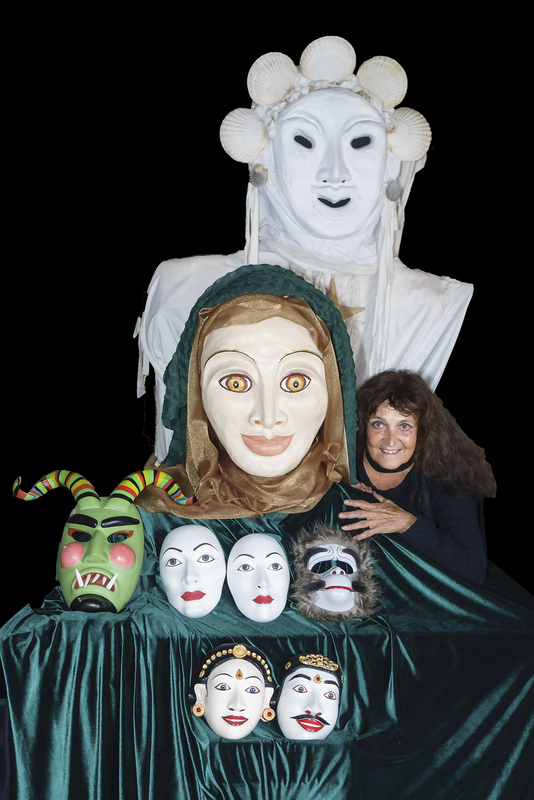 Performing with masks, puppets, and shadow theatre is simply an extension of this basic process. Likewise, musicians and even lighting and costume designers can enter into the dialogue. In this process, performances are created from original material on a theme. The collective energy is important for this kind of theatre. In this respect, it resembles another art form-- jazz. In both forms, performers need to be strong as individual artists, at the same time unleashing the collective energy of the group, creating something, which goes beyond each individual. The artists learn to do this spontaneously, becoming master improvisers. Improvisation is an important tool for building strong technique, for developing characters, for creating dialogue and scenic composition, and for summoning the collective spirit of the group. In our work, improvisation is sometimes used directly in performance, but most often, as a tool for creating material, which is then transposed into tightly choreographed scenes. The theatrical language for the total actor is oriented towards heightened physical and vocal expression to fulfill our vision of performance. Although the theatre we create is highly contemporary, it has its roots in ritual and the practice of tribal societies, where theatre, dance, music, mask play, puppets, and comedy are all interwoven in an organic whole. Young and old attend the performances, which are many-layered in their content and meaning, so that each spectator will find his or her own resonance there. This kind of theatre can be deep as well as entertaining. Our theatre is more often stylized and archetypal rather than naturalistic and psychological. It leads us into a world of extraordinary experiences-- the stories of heroes and gods, myth and magic, as well as down- to-earth humor, social commentary, and spiritual insight.